Felt like creating again...been in a little slump. Here are two projects I have been wanting to complete. 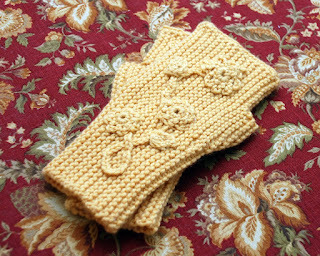 These fingerless gloves meant for my aunt (who now lives in Florida), and this linen bucket with tattered roses. I am pleased with how they turned out. 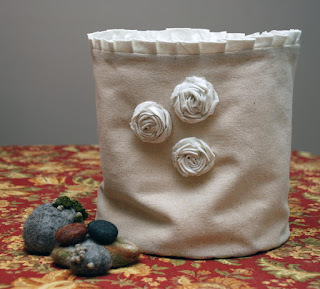 In particular, I will be making more of theses fabric buckets. It is a great way to use up some of the beautiful fabrics and trims that have amassed in my studio, aka, craft storage facility! They are terrific for storing yarn, projects and many other things. I love that they stand up alone, but you can fold them up if you need to. These will end up in my Etsy store soon, I will let you know when I have an update. Spring has begun to show up around here, slowly. I thought it would be a good idea to make a few pillow covers for the family room and lighten up the space. The walls are cozy and warm in the fall and winter, but in the spring and summer I like to bring in a little green. Here is a start. The ubiquitous (at least around our house, Mr. B. collects them) "elephant" pillow for "his" chair. Thank you to the Graphics Fairy for the lovely print. I used an iron transfer sheet on the muslin torn strip and simply stitched around it in heavy black thread, onto the green cotton print background, with my machine. I made it removable for washing by giving it a sham back. One down six to go. The rest will be different prints and solids. I have been inspired by some of the Pottery Barn and Anthropologie pillows I have seen. Do you like the little burlap and lace belt I made for my PB lamp? I have had the vintage belt buckle for a while. It is not permanent...it really is just a belt! In case, you know, I change my mind. The last project was for my grandchildren. I have placed a little table and chairs (I will post pictures after I have painted them) in the family room corner for them. This old frame and another terrific graphic alphabet from the Graphics Fairy, came together as a small tack board. The print was iron transferred to the linen and I used spray adhesive to attach it to foam core. Tacks were made from vintage buttons. It hangs just above the table. They will love it! I love your creations that you just finished. The fingerless gloves are gorgeous! I knit and crochet, but my skills are not even compared to your amazing skills. 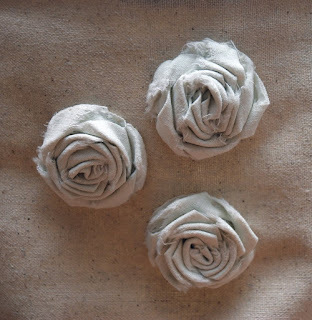 And the rosettes are so lovely! I am so glad I found your blog, I love it! Thank you so much for visiting my blog, 15 Bella Vie. Your comment was so sweet! I really like the belt around the lamp shade - a changing dream. The bucket is darling, too. I may have to make my own. What a clever girl you are. I love everything. I am especially inspired by your lampshade belt. Now I know what to do with some of the vintage buckles I've been hoarding. P.S. I finished my first nest. I will post a picture and link to your blog. I'll alert you when I do. Thanks -- it was generous of you to share your pattern and idea. I love all of your projects! The bucket is too cute and I love the little burlap and lace belt you added to your PB lamp! Those projects are so cute! I love the bucket and the lamp shade. Those are wonderful creations! I love the fabric bucket! It's adorable! Some of those would be really cute in my daughters room to store all her trinkets. I love the linin rose bucket. You are so creative, I hope you keep sharing with all of us in blogdom. I also wanted to say Thank you for your kind and thoughtful comment. You are right I would rather have a small group of followers who love what I do. I'm glad you are one of them. pretty projects. thanks for following me. Such a pretty group of projects. Love the fabric bucket with the flowers and teh fingerless gloves. Hey, Hon. I don't know where you've been, but I am missing you and your creative self! I have been knitting up your nests and having so much fun. I fully intend to add my pictures to your photo group once I can download pictures again (don't ask). In the meantime, I wanted to share your brilliance with my followers, so I posted a photo and description of the nests and then linked to your blog for the pattern. I hope that's okay. Wow, you got a lot accomplished, doesn't it feel good? I love the fabric bag, very cool, thanks for linking up.